This wonderful barred spiral galaxy presents a fantastic face on orientation. It was originally thought to be a member of the Dorada Group, but its membership has been rescinded. Scanning across NGC 1672 it is possible to identify many starburst regions with red/pink hues. Incredible dust lanes extend away from the nucleus following the inner edges of spiral arms. Many clusters of hot young blue stars can be identified along the arms as well. This galaxy is definitely an individual with its flamboyant broad arms and pale blue colouring. As you look towards the core, many dark lines and features are visible. It’s amazing that even a modest instrument of 250mm can resolve structures within a galaxy some 60 million years distant. It has an apparent size of 6.6 X 5.5 arcmin, and a brightness of magnitude 10.3. 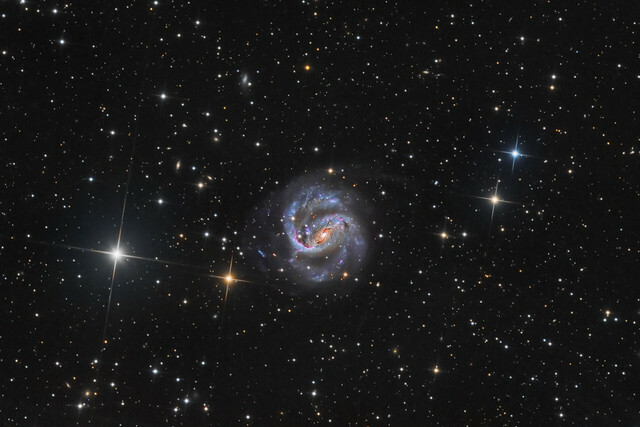 NGC 1672 is also classified as a Seyfert galaxy. They are a subset of galaxies with active nuclei. Accretion of matter onto supermassive black holes creates incredible energy outputs and can outshine their host galaxies at times. This image was created using Lum, Red, Green, Blue, and Ha filters. Edited by Terry R, 14 March 2019 - 05:01 AM. Great image, Terry, and thanks for the write-up. I usually have to spend a bit more time finding the location of your targets on my sky charts because I'm woefully ignorant of the southern skies. I had to look up "Dorado" and now know it's the "dolphinfish", which many of us actually know better as the "mahi-mahi". I can be forgiven for not knowing about this galaxy as its highest altitude in my skies is 16.5 deg below the horizon. Makes me wish for a remote obsy in beautiful Australia! Another beautiful galaxy, Terry. It looks like you have some pretty dark skies. Super Spectacular! Perfect focus and details. Color is perfect. I haven't seen many images of this guy for some reason. It's weird looking with the larger arms and how they connect to the core of the galaxy. I couldn't complain about its orientation - wow - face on is so nice when you can find it. That Earth makes for a fairly opaque filter. I get the feeling that it will cause some attenuation of the signal reaching the camera. Cool. But you have to worry about those pesky kangaroos from wanting to see what's hidden inside. Thanks Mike. It had an interesting colour for sure. Just an off blue, pale blue. Hard to describe. But interesting. You are just killing those galaxies. Amazing work.